James Wheeler was the son of Henry Wheeler and Abigail Allen. Henry Wheeler was the son of John Wheeler and Agnes Yeoman. [S95] Gary Boyd Roberts, Presidents 1995 Edition, Page 122. [S95] Gary Boyd Roberts, Presidents 1995 Edition, Page 124. [S95] Gary Boyd Roberts, Presidents 1995 Edition, Page 121. Mary Elizabeth Butler was born on 15 July 1850 at Columbus, Franklin Co., OH.1 She was the daughter of Courtland Philip Livingstn Butler and Elizabeth Slade Pierce. Mary Elizabeth Butler married Robert Emmet Sheldon, son of Thomas H. Sheldon and Martha Uncles, on 24 February 1869 at Columbus, Franklin Co., OH. Mary Elizabeth Butler died on 16 January 1897 at Columbus, Franklin Co., OH, at age 46. [S274] Thomas Neel and Sunda Peters, "George Bush." Robert Emmet Sheldon was born on 1 June 1845 at Tiffin, Seneca Co., OH.1 He was the son of Thomas H. Sheldon and Martha Uncles. Robert Emmet Sheldon married Mary Elizabeth Butler, daughter of Courtland Philip Livingstn Butler and Elizabeth Slade Pierce, on 24 February 1869 at Columbus, Franklin Co., OH. Robert Emmet Sheldon died on 21 January 1917 at 683 East Broad St., Columbus, Franklin Co., OH, at age 71. Florence Sheldon was born on 17 March 1872 at Columbus, Franklin Co., OH.1 She was the daughter of Robert Emmet Sheldon and Mary Elizabeth Butler. Florence Sheldon married Samuel Prescott Bush, son of Rev. James Smith Bush and Harriet Eleanor Fay, on 20 June 1894 at Columbus, Franklin Co., OH.1 Florence Sheldon died on 4 September 1920 at Westerly, RI, at age 48; struck by a car. She was buried at Greenlawn Cemetery, Columbus, Franklin Co., OH. [S500] Gary Boyd Roberts, RD600 (2004), Page 334. [S713] Rhonda R. McClure, Thomas Brigham, page 230. Rev. James Smith Bush was born on 15 June 1825 at Rochester, Monroe Co., NY. He was the son of Obadiah Newcomb Bush and Harriet Smith.1 Rev. James Smith Bush married Harriet Eleanor Fay, daughter of Samuel Howard Fay and Susan Shellman, on 24 February 1859 at Trinity Church, New York City, NY.2 Rev. James Smith Bush died on 11 November 1889 at Ithaca, Tompkins Co., NY, at age 64. [S713] Rhonda R. McClure, Thomas Brigham, page 229. [S713] Rhonda R. McClure, Thomas Brigham, page 116. Senator Prescott Sheldon Bush was born on 15 May 1895 at Columbus, Franklin Co., OH.3,4 He was the son of Samuel Prescott Bush and Florence Sheldon.4 Senator Prescott Sheldon Bush married Dorothy Walker, daughter of George Herbert Walker and Lucretia Wear, on 6 August 1921 at Kennebunkport, York Co., ME.4 Senator Prescott Sheldon Bush died on 8 October 1972 at New York City, NY, at age 77.3 He was buried at Putnam Cemetery, Greenwich, CT.
Sheldon and Dorothy were enumerated in the 1930 Grenwich, Fairfield Co., CT, federal census (ED 134, page 4A). He was a banker, age 34; she was 28. Children in the family were Prescott Jr. 7, Walker 5, and Nancy 4. [S182] Social Security Death Index (on-line), Ancestry.com, SSDI, Ancestry.com, SSAN 091-26-7848. [S95] Gary Boyd Roberts, Presidents 1995 Edition, Page 121/Item 3. [S182] Social Security Death Index (on-line), Ancestry.com, SSDI, Ancestry.com, SSAN 040-38-9160. President George Herbert Walker Bush was born on 12 June 1924 at 173 Adams Street, Milton, Norfolk Co., MA.1,2 He was the son of Senator Prescott Sheldon Bush and Dorothy Walker.3 President George Herbert Walker Bush married Barbara Pierce, daughter of Marvin Pierce and Pauline Robinson, on 6 January 1945 at First Presbyterian Church, Rye, Westchester Co., NY.3 President George Herbert Walker Bush died on 30 November 2018 at Houston, Harris Co., TX, at age 94. He was buried on 6 December 2018 at George Bush Presidential Library, College Station, Brazos Co., TX. George Bush brought to the White House a dedication to traditional American values and a determination to direct them toward making the United States "a kinder and gentler nation." In his Inaugural Address he pledged in "a moment rich with promise" to use American strength as "a force for good." 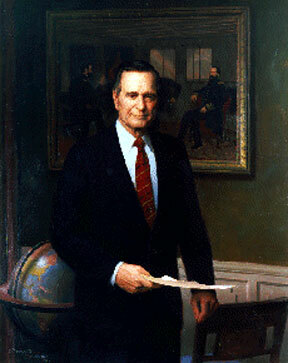 Coming from a family with a tradition of public service, George Herbert Walker Bush felt the responsibility to make his contribution both in time of war and in peace. Born in Milton, Massachusetts, on June 12, 1924, he became a student leader at Phillips Academy in Andover. On his 18th birthday he enlisted in the armed forces. The youngest pilot in the Navy when he received his wings, he flew 58 combat missions during World War II. On one mission over the Pacific as a torpedo bomber pilot he was shot down by Japanese antiaircraft fire and was rescued from the water by a U. S. submarine. He was awarded the Distinguished Flying Cross for bravery in action. Bush next turned his energies toward completing his education and raising a family. 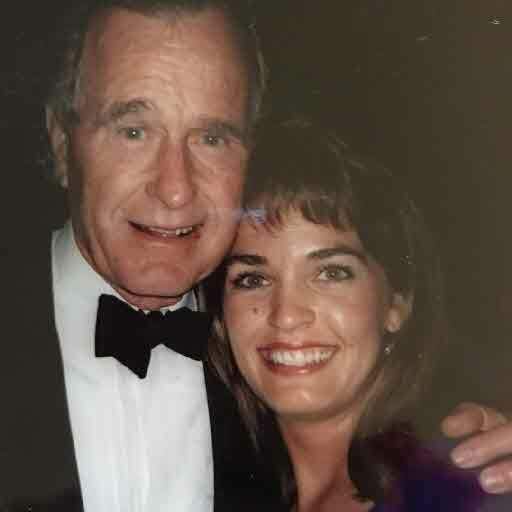 Barbara Pierce met George H.W. Bush, the man who would become her husband, at a Christmas dance in a Greenwich, Conn., country club shortly before he enlisted in the Navy. "I married the first man I ever kissed. When I tell this to my children, they just about throw up," Mrs. Bush once said. She wed at 19 and raised their five children almost single-handedly since her husband traveled frequently in the early years of their marriage. They married in January 1945; they had six children--George, Robin (who died as a child), John (known as Jeb), Neil, Marvin, and Dorothy. At Yale University he excelled both in sports and in his studies; he was captain of the baseball team and a member of Phi Beta Kappa. After graduation Bush embarked on a career in the oil industry of West Texas. 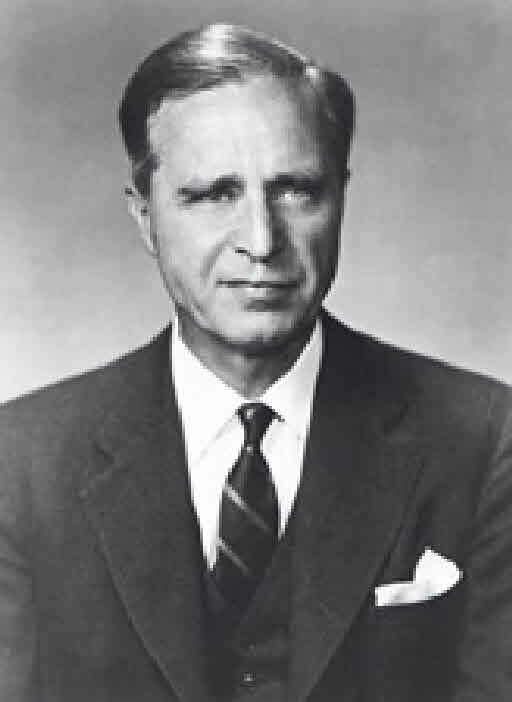 Like his father, Prescott Bush, who was elected a Senator from Connecticut in 1952, George became interested in public service and politics. He served two terms as a Representative to Congress from Texas. Twice he ran unsuccessfully for the Senate. Then he was appointed to a series of high-level positions: Ambassador to the United Nations, Chairman of the Republican National Committee, Chief of the U. S. Liaison Office in the People's Republic of China, and Director of the Central Intelligence Agency. In 1980 Bush campaigned for the Republican nomination for President. He lost, but was chosen as a running mate by Ronald Reagan. As Vice President, Bush had responsibility in several domestic areas, including Federal deregulation and anti-drug programs, and visited scores of foreign countries. In 1988 Bush won the Republican nomination for President and, with Senator Dan Quayle of Indiana as his running mate, he defeated Massachusetts Governor Michael Dukakis in the general election. Bush faced a dramatically changing world, as the Cold War ended after 40 bitter years, the Communist empire broke up, and the Berlin Wall fell. The Soviet Union ceased to exist; and reformist President Mikhail Gor bachev, whom Bush had supported, resigned. While Bush hailed the march of democracy, he insisted on restraint in U. S. policy toward the group of new nations. President Bush was several times related to his wife, the late Barbara (Pierce) Bush—via Richardsons and Kendalls of Woburn, Mass., Holbrooks of Weymouth, Mass., and probably other New England families. In addition to his son, 43rd U S President George Walker Bush, the 41st President was also related—albeit distantly—to Presidents George Washington (through the English Spencers, who are also ancestors of Sir Winston Churchill and the late Diana, Princess of Wales), John Quincy Adams, Millard Fillmore, Franklin Pierce, Abraham Lincoln, Ulysses S. Grant, Rutherford B. Hayes, James Garfield, Grover Cleveland, Theodore Roosevelt, William Howard Taft, Calvin Coolidge, Herbert Hoover, Franklin D. Roosevelt, Richard Nixon, Gerald Ford, and Barack Obama—18 in all. The kinship to Lincoln is through the immigrant Samuel Lincoln of Hingham, Mass. One kinship to Richard Nixon is through the Lippincotts of New Jersey. The kinships to Barack Obama are through the Blossoms and Hinckleys, both of Plymouth, Mass. Among First Ladies, the 41st President is related to Abigail Adams, Abigail Fillmore, Lucy Grant, Lucretia Garfield, Frances Cleveland, Edith Roosevelt, Helen Taft, both Ellen and Edith Wilson, Florence Harding, Grace Coolidge, Lou Hoover, Eleanor Roosevelt, Bess Truman, Mamie Eisenhower, and Nancy Reagan. [S274] Thomas Neel and Sunda Peters, "George Bush", Page 71. Barbara Pierce was born on 8 June 1925 at old Booth Memorial Hospital, Manhattan, NY, and raised in Rye.1 She was the daughter of Marvin Pierce and Pauline Robinson.2 Barbara Pierce was also known as First Lady Barbara Pierce Bush. She married President George Herbert Walker Bush, son of Senator Prescott Sheldon Bush and Dorothy Walker, on 6 January 1945 at First Presbyterian Church, Rye, Westchester Co., NY.3 Barbara Pierce died on 17 April 2018 at at home, Houston, Harris Co., TX, at age 92. She was buried on 21 April 2018 at George Bush Presidential Library, College Station, Brazos Co., TX. Rarely has a First Lady been greeted by the American people and the press with the approbation and warmth accorded to Barbara Pierce Bush. Perhaps this is prompted by the image she calls "everybody's grandmother." People are comfortable with her white hair, her warm, relaxed manner, and her keen wit. With characteristic directness, she says people like her because they know "I'm fair and I like children and I adore my husband." After the war, George graduated from Yale, and they set out for Texas to start their lives together. Six children were born to them: George, Robin, Jeb, Neil, Marvin, and Dorothy. Meanwhile, George built a business in the oil industry. With Texas as home base, he then turned to politics and public service, serving as a member of Congress, U. S. Ambassador to the United Nations, Chairman of the Republican National Committee, Chief of the U. S. Liaison Office in the People's Republic of China, Director of the Central Intelligence Agency, and later as Vice President. In those 44 years of marriage, Mrs. Bush managed 29 moves of the family. When her husband was away, she became the family linchpin, providing everything from discipline to carpools. The death of their daughter Robin from leukemia when she was not quite four left George and Barbara Bush with a lifelong compassion. She says, "Because of Robin, George and I love every living human more." 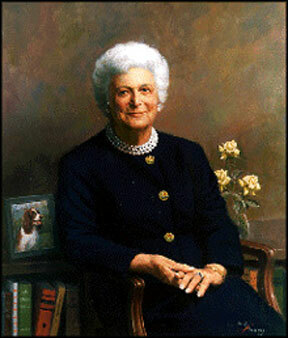 Barbara Bush was always an asset to her husband during his campaigns for public office. Her friendly, forthright manner won her high marks from the voters and the press. As wife of the Vice President, she selected the promotion of literacy as her special cause. As First Lady, she called working for a more literate America the "most important issue we have." Involved with many organizations devoted to this cause, she became Honorary Chairman of the Barbara Bush Foundation for Family Literacy. A strong advocate of volunteerism, Mrs. Bush helped many causes--including the homeless, AIDS, the elderly, and school volunteer programs. Today Barbara Bush lives in a home she and her husband built in Houston, Texas, where she enjoys being part of the community. Their children and grandchildren visit them often in Houston and at the family summer home in Kennebunkport, Maine. Devoted to her family, Mrs. Bush still finds time to work on an autobiography, serve on the Boards of AmeriCares and the Mayo Clinic, and continue her prominent role in the Barbara Bush Foundation. [S574] Gary Boyd Roberts, "Barbara Bush." [S676] Gary Boyd Roberts, Presidents 2009 Edition, page 68. [S676] Gary Boyd Roberts, Presidents 2009 Edition, page 69. Jotham Carpenter was the son of Jotham Carpenter and Desire Martin. Sybil Carpenter was the daughter of Jotham Carpenter and Mehitable Thompson. Mehitable Ingalls was the daughter of Henry Ingalls and Sybil Carpenter. Mehitable Ingalls married James Ballou. James Ballou married Mehitable Ingalls, daughter of Henry Ingalls and Sybil Carpenter. [S676] Gary Boyd Roberts, Presidents 2009 Edition, page 66. As the last of the log cabin Presidents, James A. Garfield attacked political corruption and won back for the Presidency a measure of prestige it had lost during the Reconstruction period. Fatherless at two, he later drove canal boat teams, somehow earning enough money for an education. He was graduated from Williams College in Massachusetts in 1856, and he returned to the Western Reserve Eclectic Institute (later Hiram College) in Ohio as a classics professor. Within a year he was made its president. Garfield was elected to the Ohio Senate in 1859 as a Republican. During the secession crisis, he advocated coercing the seceding states back into the Union. James and Lucretia were enumerated in the 1860, Hiram, Portage Co., OH, federal census, in the household of her parents. He was a professor of Languages, age 28, she was 28. In 1862, when Union military victories had been few, he successfully led a brigade at Middle Creek, Kentucky, against Confederate troops. At 31, Garfield became a brigadier general, two years later a major general of volunteers. Meanwhile, in 1862, Ohioans elected him to Congress. President Lincoln persuaded him to resign his commission: It was easier to find major generals than to obtain effective Republicans for Congress. Garfield repeatedly won re-election for 18 years, and became the leading Republican in the House. James and Lucretia were enumerated in the 1870, Hiram, Portage Co., OH, federal census. He was a member of congress age 38, she was 38. Children in the household were Harry A. 6, James 4, and Mary 3. His mother Eliza, age 68, was also in the household. James and Lucretia were enumerated in the 1880 Washington DC federal census, ED 39. He was a US Senator, age 50, she was 42 (?). Children in the household were Harry 16, James R. 14, Mary 12, Irving 10, and Abram 7. At the 1880 Republican Convention, Garfield failed to win the Presidential nomination for his friend John Sherman. Finally, on the 36th ballot, Garfield himself became the "dark horse" nominee. By a margin of only 10,000 popular votes, Garfield defeated the Democratic nominee, Gen. Winfield Scott Hancock. As President, Garfield strengthened Federal authority over the New York Customs House, stronghold of Senator Roscoe Conkling, who was leader of the Stalwart Republicans and dispenser of patronage in New York. When Garfield submitted to the Senate a list of appointments including many of Conkling's friends, he named Conkling's arch-rival William H. Robertson to run the Customs House. Conkling contested the nomination, tried to persuade the Senate to block it, and appealed to the Republican caucus to compel its withdrawal. But Garfield would not submit: "This...will settle the question whether the President is registering clerk of the Senate or the Executive of the United States.... shall the principal port of entry ... be under the control of the administration or under the local control of a factional senator." Conkling maneuvered to have the Senate confirm Garfield's uncontested nominations and adjourn without acting on Robertson. Garfield countered by withdrawing all nominations except Robertson's; the Senators would have to confirm him or sacrifice all the appointments of Conkling's friends. In a final desperate move, Conkling and his fellow-Senator from New York resigned, confident that their legislature would vindicate their stand and re-elect them. Instead, the legislature elected two other men; the Senate confirmed Robertson. Garfield's victory was complete. In foreign affairs, Garfield's Secretary of State invited all American republics to a conference to meet in Washington in 1882. But the conference never took place. On July 2, 1881, in a Washington railroad station, an embittered attorney who had sought a consular post shot the President. Mortally wounded, Garfield lay in the White House for weeks. Alexander Graham Bell, inventor of the telephone, tried unsuccessfully to find the bullet with an induction-balance electrical device which he had designed. On September 6, Garfield was taken to the New Jersey seaside. For a few days he seemed to be recuperating, but on September 19, 1881, he died from an infection and internal hemorrhage. [S95] Gary Boyd Roberts, Presidents 1995 Edition, Page 45. There is a Winthrop Holcombe, age 45, born in NY, a Joiner, enumerated in the 1880 Cannonsburg, Kent Co., MI federal census, with wife and 5 children. Miranda was enumerated near brother Clark in the 1880 South Bristol, Ontario Co., NY, federal census, living alone, age 37. Clark M. Holcombe was born on 9 June 1848 at NY.1 He was the son of Hiland Holcombe and Charity (?) Clark M. Holcombe married Etta A. Alford on 20 February 1875.2 Clark M. Holcombe died on 8 March 1909 at age 60. Clark and Ettie were enumerated in the 1880 South Bristol, Ontario Co., NY, federal census. He was a stone mason, age 29, she was 23. Children in the household were Carlton 4 and Stilla 2. Also in the household were father Hiland 74, and brother James H. 34. By 1900 Carlton and Stella were enumerated in the Bristol, Ontario Co., NY, federal census as servants in different households. William Holcombe was the son of Jabez Holcombe and Anne Hosmer. William Holcombe died before 7 September 1842. [S25] Hannah McPherson, Holcombe Genealogy, Page 100.1/Item A-6-7-5-8-1. David Holcombe was the son of Jabez Holcombe and Anne Hosmer. Mary Holcombe was the daughter of Jabez Holcombe and Anne Hosmer. Mary Buell was born on 1 November 1745 at Goshen, Litchfield Co., CT. She was the daughter of Capt. Jonathan Buell and Lydia Landon. Mary Buell married Jesse Judd in 1766. Mary Buell married Col. Moses Lyman circa 1787 at Goshen, Litchfield Co., CT. Mary Buell died on 7 October 1835 at Goshen, Litchfield Co., CT, at age 89. Descendant of the first Thomas Judd 1608-1688. Jesse Judd was born on 3 August 1739. He married Mary Buell, daughter of Capt. Jonathan Buell and Lydia Landon, in 1766. Jesse Judd died circa 1781 at CT.
Col. Moses Lyman married Mary Buell, daughter of Capt. Jonathan Buell and Lydia Landon, circa 1787 at Goshen, Litchfield Co., CT.
Capt. Jonathan Buell was born circa 1755 at Goshen, Litchfield Co., CT. He was the son of Capt. Jonathan Buell and Lydia Landon. Capt. Jonathan Buell married Marona Norton, daughter of Ebenezer Norton, on 20 November 1774. Capt. Jonathan Buell died on 14 February 1847. Marona Norton was born on 13 March 1755. She was the daughter of Ebenezer Norton. Marona Norton married Capt. Jonathan Buell, son of Capt. Jonathan Buell and Lydia Landon, on 20 November 1774. Ebenezer Norton was the son of (?) Norton. Deacon Timothy Buell was born on 3 May 1757. He was the son of Capt. Jonathan Buell and Lydia Landon. Deacon Timothy Buell married Olive Norton, daughter of Ebenezer Norton, on 13 November 1777. Deacon Timothy Buell married Charity Mills Norton on 13 June 1816 at Goshen, Litchfield Co., CT. Deacon Timothy Buell died on 26 January 1849 at East Bloomfield, NY, at age 91. Timothy and Olive had 6 children. Olive Norton was born on 31 January 1758. She was the daughter of Ebenezer Norton. Olive Norton married Deacon Timothy Buell, son of Capt. Jonathan Buell and Lydia Landon, on 13 November 1777. Lucretia Buell was born circa 1763. She was the daughter of Capt. Jonathan Buell and Lydia Landon. Lucretia Buell married John Norton, son of David Norton and Anna Bronson, in March 1782. Lucretia Buell died on 15 August 1852. Lucretia and John had nine children.